This coming weekend will be the beginning of this year's main project, Recycle Brevard! 101. On Saturday, January 28th, we will be at the Suntree Outdoor Marketplace from 12-2pm. We plan on being at the market the last Saturday of every month to bring information about the three-Rs (reduce, reuse, and recycle) as well as materials (brown paper bags, plastic bags, strawberry containers, nursery pots, clean egg cartons, cardboard boxes, etc.) to share with the community. We will also collect those materials plus any other recyclables and Terracycle items you would like to get rid of. On Sunday, January 29th, we will be at the Really Really Free Market of Melbourne from 1-3pm to share other materials that need a new home and can be reused. We have some toys, items for the house, and more! If it all goes according to plan, you should have plenty of opportunities to bring materials to us, pick up what you need, or simply stop by to get more information about recycling in our community. On a day like today when we celebrate the birthday of Martin Luther King, Jr. (January 15, 1929 – April 4, 1968), we should stop and reflect on the meaning of his actions and his words. Best known for being an iconic figure in the advancement of civil rights in the United States and around the world using nonviolent methods following the teachings of Mahatma Gandhi, King has become a national icon in the history of modern American liberalism. Through his speeches, he delivered strong messages of encouragement that mobilized the masses and prompted them to fight for their freedom, equality, and empowerment. He always highlighted individuals' responsibilities towards the life they lived because "freedom is never voluntarily given by the oppressor; it must be demanded by the oppressed." In order to get better, to make it count, we need to take action, voice our opinions and work toward what we believe in, keeping in mind that in each and everyone of us lies the responsibility to make our place a better place for all. According to Martin Luther King, Jr., "an individual has not started living until he can rise above the narrow confines of his individualistic concerns to the broader concerns of all humanity." 2012 is picking up and it is looking very promising from the "spread the word" point of view! We will be working on our projects to participate in the Brevard County Fair competitions: Recycling/Reuse Contest and The Art on a Rain Barrel Design contest. The Fair is from March 22dn through April 1st. As part of our Recycle Brevard 101 initiative, starting on January 28th, Recycle Brevard! will be at the Suntree Outdoor MarketPlace on the last Saturday of every month to share information about the 3Rs in the county, bring materials that can be reused by vendors and customers, and collect recyclables at the market. Also this month, we will start taking materials to share at the Really, Really Free Market of Melbourne that happens every last Sunday of each month in downtown Melbourne. In February, we will start doing the same thing at the Brevard County Farmer's Market as we will be doing at the Suntree Outdoor MarketPlace . Recycle Brevard! will be there on the first Thursday of every month. To kick off on the events side, on February 18th we will be participating of the Sykes Creek Adventures with Keep Brevard Beautiful. Sykes Creek Adventures is a family eco-festival to be held at Kiwanis Island Park from 10:00 a.m. to 3:00 p.m. on February 18, 2012. This event is chocked full of activities for folks of ALL ages. There will be food, music, boat rides (kayak and tour boat), exhibitors, hands on activities and MORE! And we will continue to do what we have been doing since Recycle Brevard! was created, like the Pelican Beach Clean Up every second Saturday of the month, and the Keep Brevard Beautiful Central Chapter meeting every second Thursday of the month. Besides those, we will be doing the other annual events we participated/organized last year, other volunteering to help with different projects, and will try to create more opportunities to educate the little ones (pre-schoolers through 3rd graders) about recycling. If you have other ideas or suggestions, drop us a line at info@recyclebrevard.org. We would love to hear from you! Got an Idea? Registration is Open! A very exciting beginning of the year in Brevard! If you have an idea and fit the profile, you can choose from many contests/competitions accepting registration now. Another good competition part of the Fair is The Art on a Rain Barrel Design contest. It is open to any business, municipality or organization willing to exercise their creativity on behalf of water conservation, stewardship and community development. Recycle Brevard will be participating in both the recycling and rain barrel competitions. The theme for our rain barrel will be the 3Rs - Reduce, Reuse, and Recycle Brevard! For college and university students, Recyclemania is accepting registration until January 20th. "RecycleMania is a friendly competition and benchmarking tool for college and university recycling programs to promote waste reduction activities to their campus communities. Over a 10-week period, schools report recycling and trash data which are then ranked according to who collects the largest amount of recyclables per capita, the largest amount of total recyclables, the least amount of trash per capita, or have the highest recycling rate. With each week’s reports and rankings, participating schools watch how their results fluctuate against other schools and use this to rally their campus communities to reduce and recycle more." (http://www.recyclemaniacs.org/overview.htm). It would be awesome if a college in Brevard participated! Anyone? On February 18th, Kiwanis Island Park will be having a Sykes Creek Adventures Paddling Challenge. Seven mile course in relatively protected waters of Sykes Creek where all types of paddling craft are invited. The challenge starts at Kiwanis Island Park on Merritt Island and the course extends up to the Barge Canal and returns to Kiwanis Island Park. And last but not least, DoSomething.org is having a DO SOMETHING AWARDS 2012 through which DoSomething.org honors the nation’s best young world-changers, 25 and under. In 2012 (up to) five finalists will appear on the Do Something Awards on Vh1 and be rewarded with a community grant, media coverage and continued support from DoSomething.org. The grand prize winner will receive $100,000 during the broadcast. Application deadline is March 1st, 2012. With so many good competitions and contests, it is impossible to not be part of at least one. Which one will you enter this year? In 2012 we would like to move up a notch! Recycle Brevard! was created to help get useful and practical information on reducing, reusing, and recycling out in the community. That way more residents will understand the importance of practicing the 3Rs and have resources to support living by them. 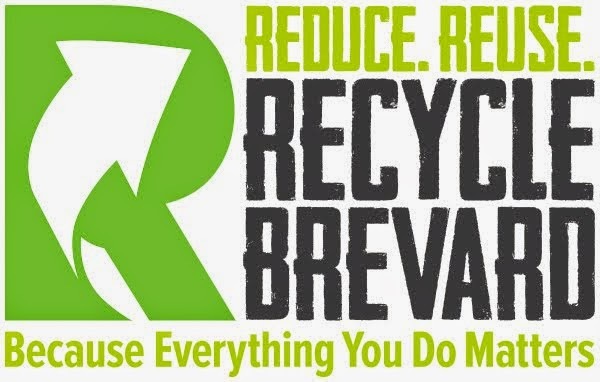 To start this year bringing Recycle Brevard! everywhere we go, we ordered and installed magnetic signs on our car and made a few t-shirts that we will wear when working on projects, participating in events and whenever else we feel appropriate. We hope that this way all we do will reach more residents and we can get even more supporters. Onwards to a swell 2012!